The choice of power amplifiers for DATV is very critical and due to a characteristic called spectral re-growth it is vital that amplifiers are not overdriven when used on DATV. The average FM or SSB amplifier MUST be backed off by over 50% or 6 - 10dB by reducing the drive from the transmitter. This means a 50 watt amplifier will only deliver a maximum 15 watts of clean DATV power! For example, these pictures show a RA60H1317M Mitsubshi 60 watt brick on 146 MHz driven by a Portsdown transmitter. The first picture is driven direct and delivering 30 watts but occupies the whole of the band - the second has a 10 dB attenuator between transmitter and amplifier and delivers 7 watts (almost 10dB down on the rated amplifier output) and needs 5 amps at 12v to achieve this! 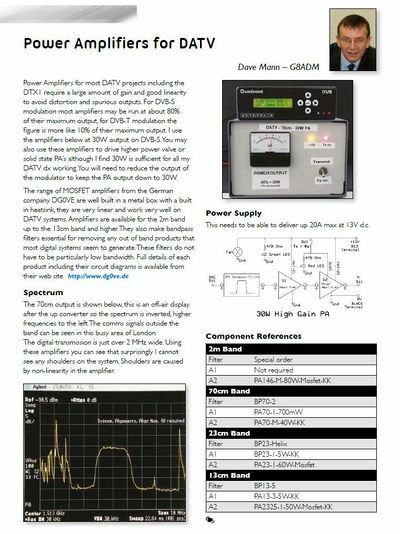 It is very important to know the power output level of your DATV transmitter so you can decide how much amplification you need. Portsdown output is frequency dependent and varies from +4dB (4 milliwatts) on 23cms to +12 dBm on 71 MHz. Output level at 146 and 437 is approximately 10 dBm or 10 milliwatts. DATVexpress is approximately 10 milliwatts on all bands. Note this article was written for the DTX1 and when used with a Portsdown you DO NOT need the additional driver stage on 146 or 437MHz and in addition  a 10 dB attenuator MUST be put between the Portsdown and final amplifier. The PGA103 is a very versatile device that can be used as both a transmit driver and a low noise reciever pre-amp. The output from the Portsdown on 437 MHz and below is too high and MUST NOT be used to drive a PGA103 as it becomes very spurious and may damage the device. NOTE - you MUST use a filter after the PGA103 in both applications! Sam G4DDK described the amplifier design in CQ-TV 242 and sells kits of parts on his web page. Details of amplifiers for the DATV bands can be found on the following pages. This page was last modified on 14 December 2017, at 17:28.